White Mandarins: "Fly away with me!" The White Mandarin is actually a mutation of the more brightly colored mandarin originating in China & now found in many captive populations. Like it’s more colorful cousin, it nests in tree cavities. 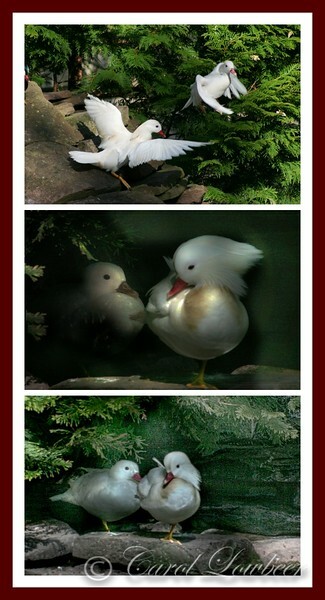 The beautiful white mandarin couples are demonstrative & put on quite a show. This pair was photographed in Connecticut Waterfowl Trust, a non-profit sanctuary which unfortunately is no longer in operation.